Winners of this year’s BHP Science and Engineering awards were given a nod for their innovative ideas on robotics and products designed to help the less fortunate and the environment. All displayed an advanced knowledge of their chosen discipline and real world applicability. A robotic window cleaner, a water filter made from agricultural waste, and a plastic made from prawn shells are the main winners of the 2018 BHP Billiton Foundation Science and Engineering Awards for school students. Oliver Nicholls winner of the Engineering category, combined his knowledge of mathematics, physics and design to create an autonomous robotic window cleaner. His design aims to reduce injury and decrease the commercial costs of window cleaning. The final product went through rigorous prototyping, testing and evaluation to show commercial viability. With aspirations to become an environmental engineer, Minh Nga Nguyen, winner of the Investigations category, used agricultural by-products such as corn husks, bamboo scraps and rice waste, to create a biochar product with the dual capability of filtering water and then being used as a fertilizer. This process reduces the effects of contaminated water and pollution created by agricultural waste. She hopes this technology will provide positive impact globally. Angelina Arora, winner of the Innovator to Market award, set out to develop a bioplastic made from prawn shell and sticky protein from the silk of silkworms. The plastic completely degrades leaving nothing harmful behind. She tested the strength, elongation, clarity, solubility, deconstruction and endurance of the plastic as well as other plastics made out of potato, corn and tapioca. Angelina hopes this plastic could replace current plastic shopping bags and other packaging to reduce the environmental impact in landfill and in the ocean. CSIRO Chief Executive Dr Larry Marshall said the award winners’ and finalists’ ideas could help all Australians cope with a rapidly changing future. “The world is changing faster than many of us can keep up with, but science, technology, engineering and maths can guide that future through innovation," Dr Marshall said. "Around three quarters of all future jobs will need STEM and we’re absolutely committed to helping school students develop these skills so they can shape Australia’s future. “We’ve seen alumni from the awards go on to do extraordinary things and I have no doubt that the winners and finalists from this year will become leaders in their chosen professions," Mr Mackenzie said. The BHP Billiton Foundation Science and Engineering Awards are a partnership between the BHP Billiton Foundation, CSIRO, the Australian Science Teacher Association and each state and territory Science Teachers Association. Six of the finalists will have the opportunity to go to Intel International Science and Engineering Fair (ISEF) in the USA where over 1800 high school students from 75 countries, regions and territories are given the opportunity to showcase their independent research. Third: Ella Cuthbert, Lyneham High School, ACT, Is honeybee silk antimicrobial? 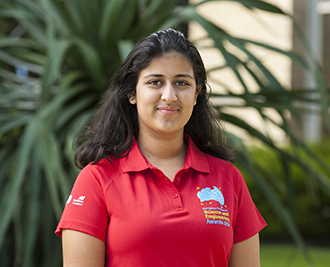 Winner: Angelina Arora, Sydney Girls High School, NSW, Shrimp shell bioplastics: A new solution to the world's growing plastic problem.